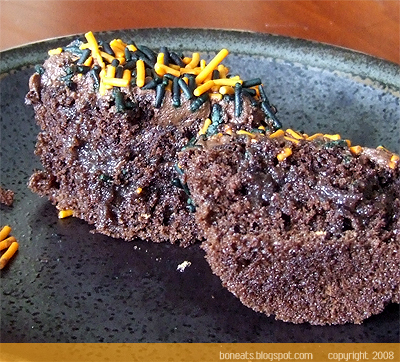 Bon Eats: Chocolate and Caramel, Oh My! Chocolate and Caramel, Oh My! 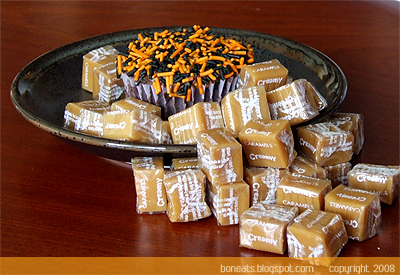 Back in the day, around Halloween, these little creamy caramel candies would pop up around the house. They were square, individually wrapped in clear wrapper, and were always kept in this large, glass jar. I loved those things: incredibly sweet with a hint of vanilla, super chewy with a rich, milky creaminess to them. They were to die for, besides the fact that they were absolutely dangerous to the teeth, since they stuck to them afterwards (ah, the joys of caramel!). I never saw them around the house any other time of the year, and as my brother and I grew older, they disappeared from our lives completely. It wasn’t until last year that I bought a bunch of these caramels and fell in love with them again. Granted, I don’t often eat them because of their high sugar content. But whenever I need a quick sugar fix and a little pick-me-up, one of these caramels is really satisfying. Last Halloween, I ended up using these caramels to make Chocolate Caramel Thumbprints. I thought that this year, it would be fun to make Chocolate Caramel Cupcakes instead, since I was already on the cupcake wagon this week. The chocolate cupcakes are based on the recipe over at Cupcake Bakeshop. It’s a super easy recipe that yields incredibly decadent cupcakes with a deeply rich chocolate flavour. What I simply did was cut a bit of the top off, filled it with some of the melted cupcakes, and placed the tops back on before frosting them. While last night was a blur, I think the cupcakes turned out to be a hit. At least no one threw a cupcake at me in disgust! In a bowl, beat the butter with a hand mixer until softened (you can also make these with a stand mixer using the paddle attachment). Add the sugar, and beat until light and fluffy, about 3 minutes. Add the eggs, one at a time, beating for 30 seconds after each addition. Add the vanilla and beat to combine. In a separate bowl, sift together the flour, baking soda, salt, cocoa powder, and espresso powder. Add about a third of the dry ingredients to the wet ingredients and beat until just incorporated. Add about half of the milk and beat to combine. Continue adding, alternating between the flour and milk, and finishing with the flour. Do not overbeat! Spoon the batter into prepared muffin tins about three-quarters full. Bake in the centre of the oven for about 25-30 minutes, or until a cake tester comes out clean. Cool completely on cooling racks. For the caramel filling: Place the caramel candies and milk in a medium microwaveable bowl. Melt in the microwave on MEDIUM for 2 minutes, or until the caramels are completely melted. Stir through, and let cool a bit before filling the cupcakes. For the chocolate buttercream: Beat the butter on high for 30 seconds. Add the cocoa and 1 cup of sugar, and beat until incorporated (don't worry if it looks dry). Add half of the milk, the vanilla extract, the instant espresso powder, and the remainder of the sugar, and beat until incorporated. Continue to add milk until you get the consistency you desire. To assemble the cupcakes: Using a knife, cut a circle at the top of the cupcake and poke it out, so that you'll have a lid. Fill the cupcake with a heaping dessert spoon of the melted caramel, and place the lid back on top of the cupcake, pressing it down a bit. Frost the cupcake with the chocolate buttercream, and decorate with sprinkles or candies, if desired. Repeat with the remaining cupcakes. Posted by Bonita at 4:48 p.m.